E-mail allows you to communicate quickly with family and friends wherever they are in the world. 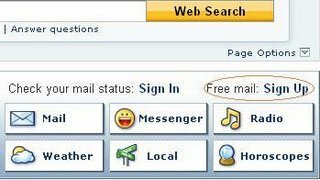 To set up an e-mail account, go to Yahoo! and click on Sign Up. Then complete the form, making sure to write down your Yahoo! ID and password. Your e-mail address will be in the form YahooID@yahoo.com where you get to choose YahooID. Whenever you want to check your mail, just click Sign In when you go to Yahoo.com. And whenever you want to give someone your e-mail address, just point them to YahooID@yahoo.com.